For its AGM weekend, 17th-19th November 2017, Bremex returned to Edale in the Peak District, a convenient midway point for members living in different parts of Great Britain. Our accommodation at The Stables Bunkhouse, Ollerbrook Farm, was as comfortable and well laid out as we remembered. 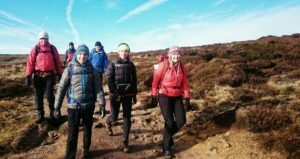 Mountain biking and rock climbing were on offer, but for various reasons, not least the cold conditions, everyone opted for moorland walking and navigation, with a grade 1 scramble thrown in on the Sunday. This resulted in us all sticking together on both days, rather than splitting into different groups as in previous years. On the Friday evening most people went to the Old Nag’s Head for a drink or meal. By the time we walked back across the fields to the bunkhouse the sky had cleared to reveal millions of stars as well as the occasional meteorite. Saturday’s route followed partly in the footsteps of the 1932 mass trespass on Kinder Scout. Near the beginning of the walk, just outside the village, we saw a large flock of starlings and a group of fieldfares – the latter a clear sign of the imminence of winter. 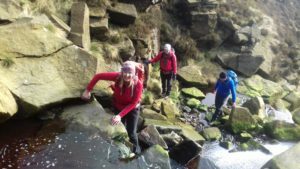 We then ascended Jacob’s Ladder and made our way to Kinder Reservoir from where we climbed up to the plateau to follow its western edge past Kinder Downfall to Kinder Low (633m). Contrary to what you might expect, this is in fact the highest point of Kinder Scout, ‘low’ being a local word for burial mound. From there we rejoined our outward route to descend Jacob’s Ladder and get back to the bunkhouse just as it was getting dark. The AGM itself started at 6pm and took less than an hour, with most of the time devoted to a review of the past year’s activities and plans for the coming one. We then enjoyed a delicious home-cooked meal, finishing in style with cheese and port. 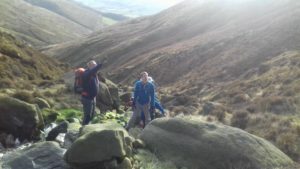 On the Sunday we did a shorter walk whose highlight was a scramble up Crowden Clough, about 2km to the west of Edale. Although this was not very difficult technically, the need to cross and re-cross the brook and negotiate slippery rocks made it quite challenging, as did the steeper and more exposed middle section. 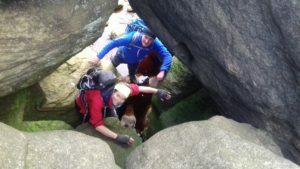 The final part involved crawling under boulders and emerging through a hole, which felt a bit more like caving than climbing. 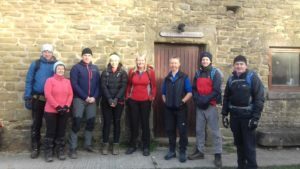 Having attained the southern edge of the Kinder plateau, we continued east and then south to the minor prominence of Grindslow Knoll (601m), where we ate our sandwiches while admiring the view of the Vale of Edale, Mam Tor and the hills beyond. We then descended Grindsbrook to return to the village for tea and cake before walking back to Ollerbrook to begin our journeys home.